In the evolutionary history of aquatic mammals, sea cows, the group that includes manatees and dugongs, once walked into the sea. It was all the rage during the early Tertiary as intermediate forms of mammals adapted to a marine life. But something was missing in the history of sea cows. None of the fossil evidence till now has shown a sea cow ancestor with four legs strong enough to support its weight on land. When did they make that critical transition from land to sea and what did the animal look like? A recent report of fossils in Jamaica describes a composite skeleton that closes this evolutionary gap between the sea cows that inspired mermaid legend, also called sirenians, and their land-roving ancestors. “This skeleton represents the first major departure from land animals toward modern sirenians,” says paleontologist Daryl Domning of Howard University in Washington, who described the skeleton in the Oct. 11 Nature. The creature Pezosiren portelli, which Domning named after discoverer and co-investigator Roger Portell of the Florida Museum of Natural History, stands on four legs and is a little more than 2 meters (7 feet) long. It is the first skeleton of the order Sirenia with legs and pelvic structure that would have been strong enough to support its massive rib cage and body on land. Today’s manatees and dugongs have foregone hind limbs for a muscled tail and use flippers instead of front feet or hooves. But they still consume sea grasses, the niche that supposedly lured sirenians to the sea. The closest living land relative of the modern sea cow is the elephant. And unlike the great whale debate — where fossil evidence has only recently supported biological determinations that hippos are whales’ nearest living relative (see Geotimes, November 2001) — morphological and molecular evidence agreed about the sea cows’ shared ancestral history with elephants years ago. But none of the sea cow fossils found has had legs strong enough for land, until now. Elephants and sea cows fit into the larger group of hoofed mammals known as Tethytheria. These animals are thought to have originated from the shores of the former Tethys Sea. P. portelli dates back roughly 50 million years, during the early middle Eocene, Domning says. This is the first indication of when the sea cows began to adapt to a more aquatic environment. “Going back from this species we would expect to see no aquatic adaptations at all,” Domning says. The aquatic adaptations of this sea cow include a large retracted nasal opening near the eye sockets on the skull. The skeleton also has four vertebrae rigidly jointed together on top of the pelvis, but not fused together as in land animals. It shows a tendency for more flexibility in the hips allowing the hind legs to kick back and upward, as it might have done in the water. The fossil ribs are the giveaway signs that this animal spent much of its time in the water. Each rib is round and thick and hefts some weight, like a frozen, chocolate covered banana on a stick. In comparison, a terrestrial animal’s rib is more like the stick: light and thin. The heavy density of the sea cow’s ribs acts as ballast. 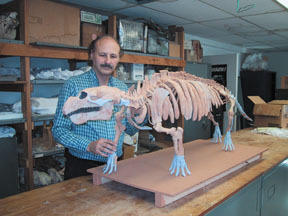 “This animal had the anatomical equipment to walk on land,” Domning says. “But it would have been like a diver walking around with his weight belt. I believe it spent most of its time in water.” Still, the find is the first sirenian thought capable of exploiting either possibility. Portell discovered sirenian ribs protruding from a siltstone and sandstone matrix while reconnoitering around Jamaica for invertebrates in 1990. “The Seven Rivers site when we found it was only a manmade drainage ditch to divert a stream,” he says. Four years later, Domning joined Portell and colleagues to specifically investigate the site for its sea cows. National Geographic Society helped fund the expedition.